By the grace of Lord Sri Hari and our beloved Sadguru Maharaj, the residents of Orlando gathered for a mass prayer at Visconti Maitland, Orlando on the evening of Saturday, August 29th, 2009. 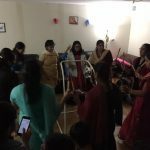 The event was hosted at the Visconti residential community, where our GOD satsang members regularly gather for weekly satsangs. 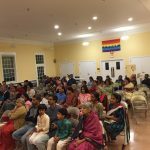 The satsang was a successful one, thanks to the dedication and efforts of Nirmalji-Aparnaji, Rupaliji, Sambiji – Vinothaji and other devotees from the GOD family in Visconti community. 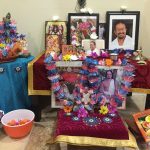 On Saturday evening at 6:30 pm with the blessings of Madhuri Saki Sametha Sri Premika Varadan and Sri Sri Swamiji, all devotees from different GOD satsangs of Orlando came to Visconti, Maitland for the mass prayer event. The event started with Sukanyaji singing kirtans on Sri Rama and Sri Krishna. Then Sri Aravindji spoke on Nama Sankirtan being the simplest and easiest dharma for the current age. He also mentioned the need for prayers. This was followed by Mahamantra Sankirtan for about 15 minutes, followed by a few Bhajans by all the satsang members. Then Narayananji who had come from Boston, gave a discourse. He started by narrating the story from Srimad Bhagavatam, of young boy Dhruva and highlighted how satsang and Sangha of a Guru is most required in our quest for God. The stories went in a chain linking different incidents in the life of Mahans and stories in Srimad Bhagavatam that stress on the importance of ‘Shravana’ and ‘Bhagavan Nama Smarana’. He cited several Alwar Pasurams such as “Apothaikku ipothey soli vaithen”, “Ecchuvai perinum venden arangamaa nagarulaane…”, “Kulam tharum selvan thandhidum… Narayana enum namam”. He also explained the conversation between Suka Muni and Praikshit Maharaj on how sins attract Narakas (hells) and atonement is not a solution for sins, as it only makes one commit more and more sins. Then came the narration of Ajamila’s story – the favorite of our Guru Maharaj. Although he was a great sinner, Ajamila called out his last son’s name – “Narayana” during his last breath and the Lord sent His Parshadas to save Ajamila. The conversation between Yama Dhutas and Vishnu Parshadas was discussed. We were also taken to Yama Loka to hear the conversation between Yama Dhutas and Yama Dharma Raja establishing the glory of the Divine Name of God. Yama Dharma Raja beautifully explains that above all the Dharmas and Shastras is a Dharma called “Bhagavata Dharma” which was known only to 12 people – the one shown in Srimad Bhagavatam. There may be sorrows and joys to devotees who chant the Divine Name, but through mere chanting, the Lord will transform us such that all these sorrows shall soon seem trivial and one would gain clarity in approaching any problem. Jnaneshwar Maharaj’s Abhang ‘Kala Vela Nama Ucharita Nahi…’ was quoted to show how by mere chanting of the Divine Name, one’s forefathers attain the Vaikunta. Towards the end of the talk, with prayers in the minds, devotion in their hearts, and hands clapping, all the devotees chanted the “Hare Rama…” Mahamantra praying for their wishes to be fulfilled. The satsang closed with all the devotees offering flowers to Madhuri Sakhi sametha Sri Premika Varadan and beloved Guru Maharaj, followed by distribution of fruits and Prasad.